This article originally appeared in Patient Safety & Quality Healthcare. 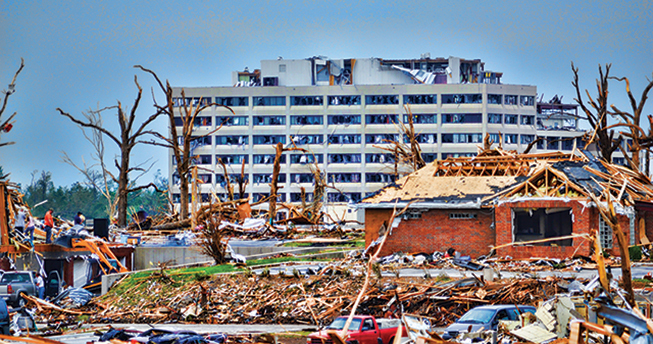 St. John’s Regional Medical Center in Joplin, Missouri (part of Mercy Health System), was destroyed by a tornado on May 22, 2011. Mercy Hospital Joplin has been providing services to patients and the community in modular facilities built since the tornado and will open a new 600,000 square-foot facility in 2015. Emergency evacuation preparedness is on every health facility manager’s priority list. If patients are not provided with safe and realistic means of evacuation in the event of an emergency, how can an organization claim it provides quality care at the facility? While evacuation planning takes time and effort, it offers return on investment in terms of increased patient safety and better risk management. Many facets of healthcare evacuation planning often go overlooked, which is seldom apparent until the moment of crisis. Thoroughly preparing a facility and staff for a real-world emergency evacuation will ensure the proper care and protection of all patients and ultimately the hospital’s post-event recovery. Developing an emergency evacuation plan will help ensure patient safety during an emergency and, just as important, increase buy-in from the staff and management. The following is a to-do list for developing an evacuation plan. The first step in evacuation planning is to establish a group of key decision makers who can provide a broad perspective on facility operations including risk management, security/safety, nursing operations (adult and pediatric representation), facility management, and the emergency department. Each member of this team should share responsibility for ensuring the facility is prepared to evacuate in the event of an emergency. The right team will deliver a thorough, in-depth plan grounded on what will actually be required for a facility to become evacuation ready. This established team is the most important factor in developing a quality plan and will ultimately determine the success of the plan’s implementation and system-wide buy-in. Determining the vulnerabilities of a facility may seem relatively basic and simple on the surface, but in reality it is not. The list of natural and man-made disasters is long and can vary widely depending on the builidng’s location, type, age, and condition as well as the surrounding climate. During this stage, the worst-case scenario must be considered for each type of vulnerability. Natural disasters are typically well documented, so there are many resources available to determine those that pertain to your geographic area. One of the critical mistakes made in this step is underestimating the risks associated with the geographical natural disaster. The team cannot simply dismiss certain risks based on probabilities and weather history. For example, nearly one-fourth of all large tornadoes occur in the south-central United States, yet many of the most high-fatality tornadoes to occur in recent years have struck other parts of the country such as the southeastern United States, where tornadoes are rare (The New York Times, 2011a). In fact, out of the 20 states that experience tornadoes most often, five are in the southeast (FEMA, 2011). To best assess these vulnerabilities, the team must stay informed of factors that are likely to affect the region and plan for the worst-case scenario. Additional preparedness resources can be found via the Federal Emergency Management Agency at www.ready.gov. Determining a facility’s vulnerabilities to man-made disasters such as fires, terrorist attacks, and power outages is a much more difficult task due to the unpredictable nature of these events. For this reason, it is best to be very broad in planning for man-made disasters. To assess equipment needs, the team must use facility-specific data including average daily census and patient non-ambulatory rates by unit, facility floor, and layout (fire breaks, protocol evacuation exits, hall runs, etc.). These factors, along with evacuation protocols, will determine how much equipment will be needed to properly evacuate the facility. This process can be conducted by a manufacturer, but the assumptions used must be driven and owned by the emergency planning team. Carry devices require the user to physically lift and carry the patient. These devices can create additional risks for staff members during an evacuation. Carry devices are typically used only by professionals such as fire fighters or first responders who have extensive training. Wheeled devices consist of any device that uses wheels to make the movement of patients easier, such as stair chairs or wheelchairs. While more functional than a carry device, a wheeled device can easily become a carry device if debris is encountered. Wheeled devices also do not address the need for vertical evacuation. Evacuation sled devices use the non-lift method and require significantly less strength to move non-ambulatory patients. Evacuation sleds allow staff members to safely move a patient two to three times their weight horizontally and vertically down stairs if necessary. Based on this wide range of equipment to choose from, it is crucial to consider your staff capabilities and patient needs when assessing what type of equipment is best. For example, there is a major risk posed to patients in multi-level facilities as opposed to single-level facilities due to the complications of stairwell evacuations. Individuals with mobile disabilities or injuries will have increased difficulty transporting themselves out of a multi-level facility in the event of an emergency. The evacuation equipment selected can either simplify the evacuation process or add risk factors for staff members and patients. Caching evacuation equipment should be avoided; each unit must be self-sufficient in addressing the needs of its patients. In an evacuation, time is a critical asset that should not be wasted by waiting for evacuation equipment to be brought up from a storage closet in the basement. As a general rule, equipment must be deployed to each unit. Depending on the floor layout (exits, fire doors, etc. ), equipment should never be stored in just one location, even on a given floor. A common shortfall in most plans is underestimating manpower needs to conduct evacuations. For this reason, it is critical to conduct a manpower assessment for each shift. The primary factors in determining the manpower required to evacuate a facility are the number of non-ambulatory patients, how much evacuation equipment is on hand, number of floors in the building, and exits to be used during evacuation, or “protocol exits.” This is especially true if a protocol calls for a bucket brigade to be established in stairwells to move non-ambulatory patients down the stairs. Although proven to be a best practice, this requires changes to the number of evacuation stairwells due to manpower constraints. The number of protocol exits may need to be adjusted to decrease the manpower needs during those shifts where a smaller labor pool would be available (typically night shifts). Fewer protocol exits mean fewer staff members are needed, but evacuation will take longer. Last, an important fact to consider when assessing manpower needs is that the staff, not first responders, will most likely carry the primary responsibility for evacuating patients. When Super Storm Sandy hit New York City in late 2012, the staff of NYU Langone Medical Center in Manhattan had to evacuate patients as quickly as possible when the facility’s back-up generators failed. The occupants of the facility included ICU patients, women in labor, NICU infants, and bariatric patients. To efficiently evacuate this wide range of patients from the 18-story hospital, clinicians and staff members used non-lift devices with tethered braking systems to safely and quickly move non-ambulatory patients down stairwells. The lessons learned from this emergency evacuation are 1) healthcare facilities must be able to evacuate the sickest and most frail patients safely and quickly under all conditions, and 2) you must plan on using internal facility and staff rather than first responders. It is recommended to partner with an equipment manufacturer when performing this level of assessment. Manufacturers are often knowledgeable enough to assist in this process. If an equipment manufacturer is unhelpful or not trustworthy enough to do an unbiased assessment, find a new manufacturer partner that can be trusted to fully support all your evacuation planning efforts. Most healthcare facilities have relied solely on federal grant funding for emergency preparedness efforts, but these budgets have decreased dramatically over the last few years. During this time, two recognizable trends have emerged. First, healthcare facilities that have developed quality, data-based plans and have worked with emergency planning coalitions to integrate their facility’s plans with area-wide plans have been more successful in securing grant funds. Second, healthcare facilities, especially larger complexes, have realized that grant funding alone will not be enough to get their facilities evacuation ready. By developing realistic plans that have multi-organization support and data-driven requirements, emergency planning teams have been successful in getting senior management to allocate operating expense funds and/or capital funds to provide for the evacuation plan requirements. When proper funding is secured, picking the best equipment for a facility should be easy. By this point in the process, the emergency planning team should be familiar with what is required of the evacuation equipment. Before making a decision, a side-by-side test should be conducted on all viable options, even if the team has previously worked with a specific manufacturer. A key to success when comparing equipment is to ensure the scenario used for side-by-side testing matches the worst-case evacuation scenario. Too often healthcare emergency planning teams leave the “demo” up to the manufacturer, allowing inconsistencies and differences in capabilities between devices to be overlooked as manufacturers present their device in ways that highlight its strengths and obscure its weaknesses. Last, pursue a partnership with an equipment manufacturer who will be there before and during the sale, as well as after implementation. This partner should invest time and resources to assist in making the facility evacuation ready. The manufacturer should share the same commitment and passion to evacuation safety as your emergency preparedness team, effectively becoming another member of the team. These partnerships provide the facility with valuable resources by sharing best practices and providing insight on the use, implementation, and deployment of equipment. Deploying equipment strategically throughout the facility based on the type of equipment and the specific needs of each unit of the facility is critical. The type of equipment that should be stocked in a particular area can vary widely depending on patient needs, from the smallest NICU baby to the largest bariatric patient, from the basic acute care patient to the sickest ICU patient, and everyone in between. With a large percentage of overweight patients, it is recommended to stock equipment designed specifically for bariatric patients. Typically, it is recommended to have 20% of adult evacuation equipment dedicated to address the needs of bariatric patients. This number could increase when dealing with specific units of a facility. Give your staff the support and training it needs. When planning for a large-scale hospital evacuation, the staff is an invaluable resource that must be used wisely. Understanding the staff and their capabilities is essential to any evacuation plan and plays a critical role in the hospital evacuation process. These individuals will perform on a much higher level during an emergency if properly trained and equipped. Staff training is a critical aspect of emergency planning for any healthcare facility. Key staff members should be thoroughly trained in every aspect of the evacuation plan to adequately prepare them for whatever type of disaster may strike. These areas include general emergency education, equipment training, reviewing emergency plans, assigning specific roles during an emergency, and familiarizing staff with patient needs. While providing staff members with evacuation training is important, it is also costly in terms of valuable employee time. For this reason, select equipment that is intuitive and easy to use in order to minimize the time required for an employee to understand its basic operation. An added benefit of intuitive equipment is that an unfamiliar staff member or patient could use it during an evacuation if needed. In addition to intuitive equipment, staff members should receive training on a regular basis rather than one-time sessions. Manufacturers can often be relied on to provide “train the trainer” sessions and video-based training for employee use. Another common practice is to establish one staff member from each unit as a “super user” who can perform just-in-time training during an emergency if necessary. Protocols and plans taught to hospital staff members are only worthwhile if they are practiced on a regular basis. Research suggests that realistic drills have the ability to increase individuals’ knowledge and emergency response skills while lowering their negative trauma reactions during emergencies (National Association of School Psychologists, 2012). Emergency evacuations do not take place in a safe or convenient environment, so drills should simulate the most realistic situation possible; Play noise over the intercom, turn off the lights, do not use elevators, and include mock patients who are immobile. It is very important for healthcare organizations to be self-reliant during these situations, as fire departments and first responders often don’t arrive in time for an evacuation. However, it is useful to partner with local emergency personnel, who will often help conduct the drills. This type of practice will truly prepare staff members for a real-world evacuation. A lack of preparedness can lead to devastating consequences during an emergency evacuation. Practice drills counteract this risk by realistically running through evacuation procedures with the staff. The time and effort required to perform regular drills and training sessions is negligible compared to the effect of a disaster striking a building with unprepared staff members. There are two key benefits that effective drills provide: 1) building the team’s awareness and understanding of the plans and protocols and (2) identifying unrealistic assumptions and gaps in a plan. A post-drill assessment should be conducted to capture this information, which can be used to drive improvements to existing plans. In summary, emergency evacuation preparedness is a crucial aspect of healthcare facility management. While evacuation planning takes time and effort, it is crucial in terms of patient safety and risk management. Following the steps outlined above will greatly increase your and your team’s ability to implement and prepare your facilities and staff for a real-world emergency evacuation. Ensuring your facilities are “Evacuation Ready” will guarantee the proper care and protection of each and every patient, guest, and staff member in your facilities.